It all started with a silly mischief between a boy and a girl. Mick and Savannah go to school together. Savannah is fairly new to the neighbourhood, and Mick doesn't like the attention his younger brother Finley gives to this new girl. It's all kids' problems, naive and harmless, until one night Mick's neighbourhood gets attacked by none other than a robot! A real robot! And not just one robot! An army of killer robots whose primary goal is to destroy Mick and all he cares about! Okay, to scare him to death rather than to destroy him, but you get my drift. After Finley's disappearance, all bets are off and Mick, Savannah, and other kids from school join forces to save him, and the neighbourhood, from this monstrous threat. 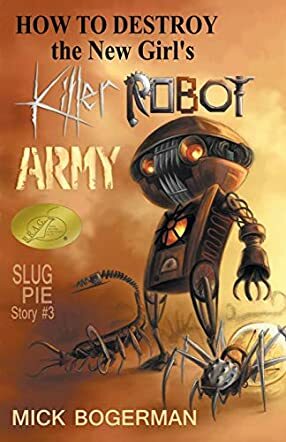 It was such an immersive experience to read Mick Bogerman's adventurous book, interestingly titled How to Destroy the New Girl's Killer Robot Army, subtitled Slug Pie Story #3, as we find out while reading that this is not the first supernatural sci-fi adventure Mick and his brother Finley are going through. The style of writing in Bogerman's tale fits the overall atmosphere in the book, and the childish, but really clever humour takes readers back into their own childhood, bringing up memories from long ago, running down Memory Lane...not walking, because the described killer robots are really scary! The formatting and the overall appearance of the book add to the whole impression of reading an extensive guide on the topic, with tips and a list in the end to help you prepare for the next possible killer robot army invasion in your own neighbourhood. Thoroughly fun and exciting, full of action and suspense, and an educational angle for the targeted audience, this book leads the reader through a life lesson of what happens when one starts bullying at school, the consequences of one's actions, forgiveness, and the creation of true and long lasting friendship. We are proud to announce that HOW TO DESTROY THE NEW GIRL’S KILLER ROBOT ARMY by Mich Bogerman is a B.R.A.G.Medallion Honoree. This tells a reader that this book is well worth their time and money! My grandson got an A on his book report he needed to write and present for his 5th grade class after reading this book. He has bought all of these books with his own money he earns from doing chores. He is a dedicated fan of Mr. Bogerman. Keep writing for this 5th grade boy! This is my favorite new author and it had ROBOTS. Close to midnight of the book's debut, I was not so patiently waiting for it to download to my kindle. This is my favorite new author and it had ROBOTS. It couldn't get much better. Read it in one sitting, but then really glad that I didn't hear scratching in the walls that night. I like the new girl in the series and how each of the brothers react to her. I am looking forward to seeing more of her in future books. If you haven't started the series yet, please do. You will really enjoy it. Very entertaining and inventive story. I very much enjoyed this book. It's the first in the series that I've read, but it was a stand-alone so it wasn't necessary to have read the others in order to enjoy this one. The story starts when a new girl Savannah turns up at the school and Mick takes an instant dislike to her. She is better than him in many areas, including taking the affections of his little brother Findlay. He devises a plan in order to get rid of her, but little does he know that an army of killer robots is about to try to settle the score. The storyline was very entertaining and inventive. Savannah's vocabulary may have your child reaching for a dictionary occasionally, but it has the same effect on Mick so they won't be alone in that regard. Very clever use of imagery throughout, and all of it topped off with a very satisfactory ending. The first two in the series have definitely made it to my reading list. I received a copy of this book in exchange for an honest review. What kids won't do to each other?! I got this book cause it looked interesting and differnt from what I normally read I really didn't see the age til I excepted it, needless to say I'm well over school age however I think my niece will love it, I actually really liked it a story of two kids with friends who get off on the wrong track just goes to prove don't judge someone before you know them, they may just suprize you but then again watch who you make enemy's with. I haven't read any of the other books but this one makes me want to, my inner child loved this book, it was just very fun and I must say the cover art is awesome.